So to make do without a mantel, I instead use shelves and other pieces of furniture to get my holiday fix in. And because of Noah, unless it's up high, the decorations need to remain in the part of the living room that we've barricaded off from him. The sofa table (in the barricaded area) acts as our mantle and I hang our stockings there. 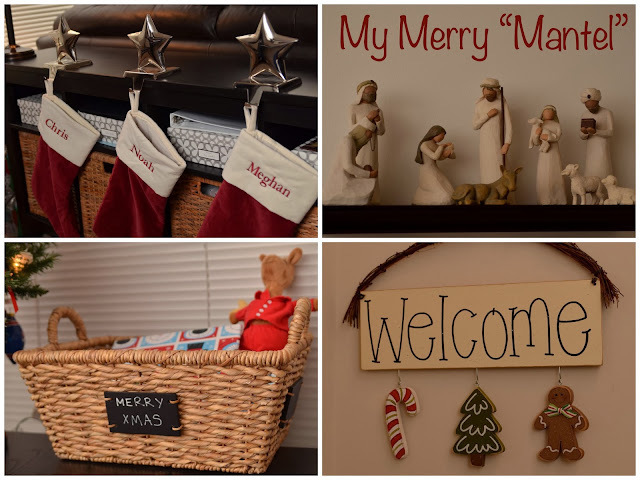 (The sofa table is also where I store a lot of craft supplies, so don't mind the boxes behind the stockings.) 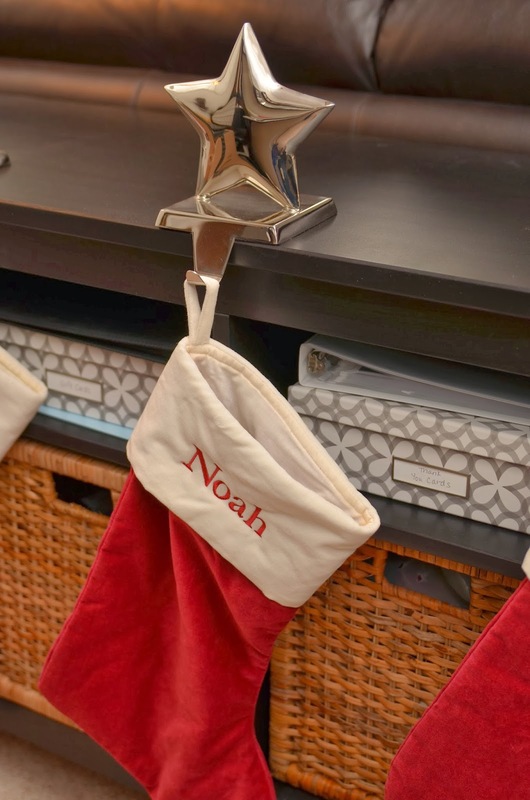 I got the star stocking hangers from Crate and Barrel during an after Christmas sale a few years back and my mom got us the personalized stockings from Pottery Barn. 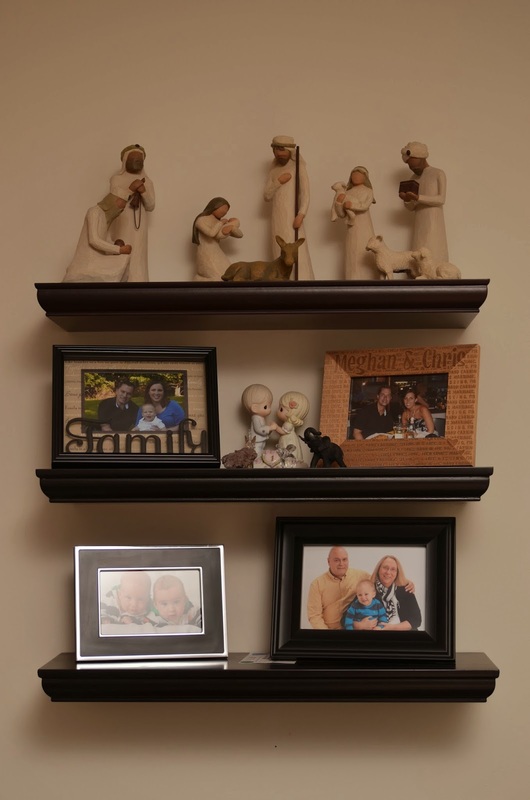 Next up, I use our floating shelves to display our Willow Tree Nativity Set. It has to go on the highest shelf so the tall figurines will fit. I love having the mix of fun colorful decorations mixed with this subdued religious set... brings both aspects of Christmas together! I also decided to decorate around the apartment in other small ways. When you enter our apartment, you see this welcome sign. The hanging decorations are changed out each month, and I love the December set! I also decided to put some multi-colored lights on our bulletin board. 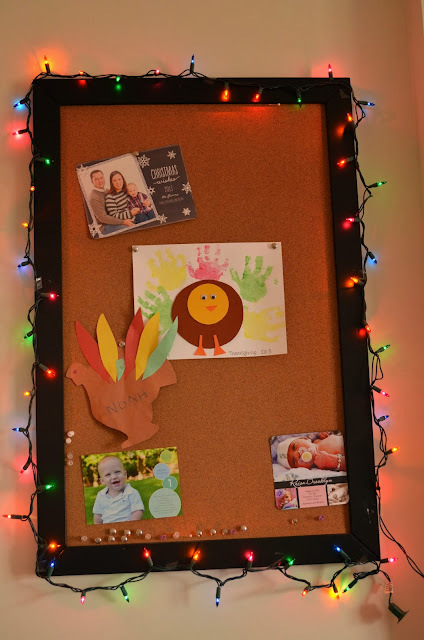 Currently it still has Noah's Thanksgiving crafts and birthday invitation on it, but hopefully it will soon display all the Christmas cards we receive. You can even see our Christmas card hanging there! And finally, sitting next to our mini tree (which is on our kitchen table! ), we have this basket filled with the 24 wrapped Christmas books that we are giving Noah each night until Christmas! I love this basket (from Target) and plan to use it for Noah's toys after Christmas. I am linking up with Michelle at Ten June and Carmel at Our Fifth House! Very pretty! And I LOVE your stockings of course : ) Twins!